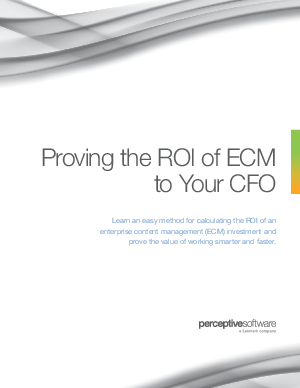 White Paper Published By: Perceptive Software, Inc. Proving the value a technology brings to your business is important in any economy. In today’s business environment, it is critical. Whether selecting or justifying a business software purchase, calculating return on investment to make your business case to the C-suite is no longer optional. From your smart phone to the most sophisticated business software, all technology is designed to add efficiencies and improve our lives. In the 1990s, businesses adopted new technologies rapidly, often without taking a hard look at the benefits. After tough lessons learned, many organizations now require an analysis of the costs and benefits of any proposed technology expense. While executives want to see proof of ROI, many executives and project managers do not believe their teams have the tools, training or time to calculate ROI effectively. Fortunately, with the right approach, calculating ROI to prove your business case can be done relatively quickly and simply. As the following Perceptive Software customer stories illustrate, calculating ROI can help you select the right solution, or justify an expansion. The process can begin prior to purchase or after implementation, and it can be streamlined to meet the time and resources available to your organization.